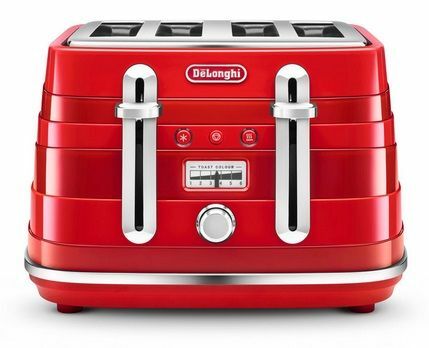 DELONGHI CTA4003.R Avvolta 4 Slice Toaster Red. Start your day with deliciously browned breads, bagels and more prepared in the elegant Delonghi Avvolta CTA4003.R 4-Slice Toaster. The Avvolta CTA4003 is designed with non-slip feet and removable crumb tray so it sits perfectly on your kitchen counter and is simple to clean. It features reheat, defrost and mid-cycle electronic controls plus variable browning so that you can enjoy toast exactly as you like it.